If you are one of the many greyhound owners who can't bear to be apart from your best friend for any length of time, you will need to know the basics of traveling with your dog. 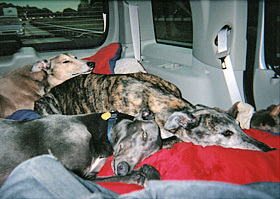 Traveling with your greyhound can be a great source of fun. 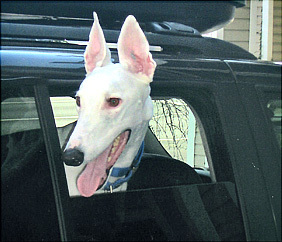 Most greyhounds enjoy riding in a vehicle, and also do well on trips or vacations and careful planning will make your trip go that much smoother. 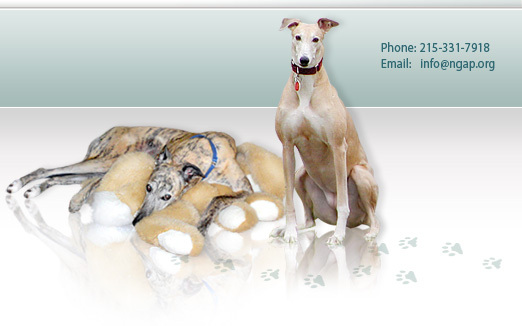 Although NGAP does not endorse any particular method of traveling with your greyhound, we trust that you, as the owner, will research your options and decide on the method that is best for you, your family, and your dog. Whether you plan to fly or drive, a trip to the vet is a necessity before you leave. Airlines will definitely require a health certificate to be issued by your veterinarian before your departure. Check with your airline for paperwork deadlines and requirements. If you're visiting a foreign country, they will require a health certificate to enter the country. Each country's requirements may be different. 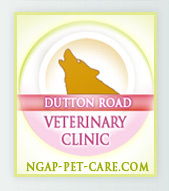 Without the required vaccination records, your pet may be quarantined. We also recommend that you know the laws regarding pet ownership in the areas you will be traveling to. Some areas may have very strict regulations, and you may prefer to leave your pet at home rather than risk encountering any difficulties. Discuss with your vet any medications you may need to take along, or that may come in handy while you and your pet are traveling. If your greyhound does not get a clean bill of health from your vet, he would probably be better off staying home. Make sure you have current tags on your greyhound. An accurate personal ID tag, county license, NGAP ID and microchip tag are a must. Do not attach your greyhound's ID tags to the "D" ring of their martingale collar; use the side rings. That way if the tags get caught on something, he won't choke attempting to free himself. While traveling, you may want to cover your dog's personal ID Tag with opaque adhesive tape or paper with the address of where you are staying and local or cell number where you can be reached and then seal it with clear tape. You might consider informing NGAP of your travel plans in the event your pet gets loose while you're traveling. Many people and organizations will contact us when they can't find you. Keep a recent photo of your greyhound along with a record of their ear tattoos, microchip number, proof of vaccinations and your greyhound's health record with you. Keep our phone number with your travel documents so you can contact us if you lose your dog on your trip. Don't forget to take plenty of food, water and any medications your greyhound needs. It's always preferable to keep your pet on the same food and routine to eliminate some of the stress from traveling. Be sure to take lots of plastic bags, paper towels, water and a pooper-scooper for cleaning up after your pet. Research your destination and route as many parks and recreation areas do not allow pets. You may also want to research local vets for emergency purposes. If your greyhound is going to meet other animals, make sure you pack his muzzle. Take your dog's toys and other belongings to help him adjust to his new environment. If traveling by car, you may choose to crate your dog. 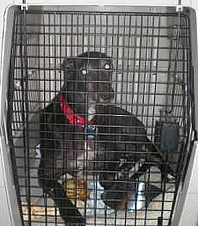 A wire crate is a good choice as it provides better air circulation and viewing for your greyhound than other types of crates. Your pet will be far safer in a crate in the event of an accident than he would be if he was loose in the car or van. Make sure the crate is large enough for your dog to stand and turnaround in. Place the crate in a well-ventilated area of your car so he gets plenty of air. For greyhound owners who prefer to have their greyhounds remain loose in the car, make sure there is plenty of room for your greyhound to stretch out and relax during your trip. Providing soft blankets and cushions for him to sleep on will help him to settle down and get comfortable. Fill the backseat leg-space of four door cars with cushions or soft packed bags and cover with a blanket to increase safety and provide more room. Try to stop at dog friendly locations, where your pet is welcome. Provide him with plenty of water. Never, ever leave your pet in a car. In warm weather, your car will heat up quickly and your greyhound can overheat and die. Dogs should only travel on long trips if they enjoy car travel, if it can be helped. Some dogs will routinely get sick while traveling by car while others love it. Many motel and hotel chains have become pet-friendly in the last few years, but it is important that you check with your specific hotel location on the weight and size specifications of your canine companion and any restrictions they may have. Before you subject your greyhound to a hotel for the first time, we suggest that you try an overnight stay at a local hotel first. 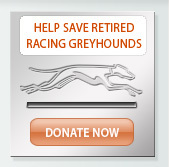 This will allow you a chance to monitor your greyhound's behavior in a new and strange place. Not all greyhounds enjoy and adapt well to new environments. If your greyhound is comfortable with hotel stays, you may still want to keep him confined to a crate or X-pen when you leave him alone in your room. 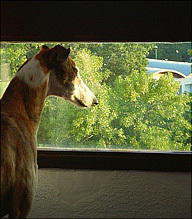 Your greyhound may try to follow you after you leave and a stressed, anxious, or frightened dog may become destructive. If you're traveling by air, make sure you find out your airline's requirements for animals traveling with you. Airlines will require you to crate your dog. Check with your airline for specific crate requirements. Some airlines will not permit large animals to fly in or out when the weather gets hot (above 80 degrees). Space is also usually limited, so be sure to make your reservations early. If traveling by air, make sure you have the approved crate and label it properly with ID and destination. Discuss all details with your airlines. Most importantly, never, ever let your greyhound off the leash when traveling! Be very careful when opening and closing the crate door and vehicle doors.